The following bulletin was obtained from the website of Florida International University. (U) Chinese Talent Programs are a vital part of Chinese industry. Talent programs recruit experts to fill technical jobs that drive innovation and growth in China’s economy. National, provincial, and municipal talent recruitment programs provide opportunities for experts to work in industry and academic organizations supporting key areas deemed critical to China’s development. The talent programs recruit experts globally from businesses, industry, and universities with multiple incentives to work in China. Associating with these talent programs is legal and breaks no laws; however, individuals who agree to the Chinese terms must understand what is and is not legal under US law when sharing information. A simple download of intellectual property (IP) or proprietary information has the potential to become criminal activity. (U//FOUO) The large number of foreign students, researchers, scientists, and professionals in the United States, combined with current technological capabilities, allows foreign governments to contact and recruit individuals with the hopes to acquire advanced technology without research costs. While the majority of the population are law abiding individuals, anyone has the capability to acquire information. The theft of information can come from current or former employees, business partners, consultants, contractors, temporary hires, foreign agents, suppliers, or even vendors who have access to proprietary information. (U//FOUO) Severely impact the US economy. (U) The goal of this SPIN is to provide an overview of the potential threats posed by the Chinese Talent Programs. (U//FOUO) China’s most prominent national talent recruitment program is the “Recruitment Program of Global Experts,” which is commonly known as the Thousand Talents Program. It focuses on identifying key national-level organizations and associ-ated personnel involved in implementation and management. (U) Its goal is to recruit ethnic Chinese experts from Western universities, research cen-ters, and private companies to boost China’s national capabilities in the science and technology (S&T) fields and to move China forward as an innovative nation. The pro-gram also implemented sub-programs for both young and foreign (non-ethnic Chinese) experts. (U//FOUO) Originally, this program had a five-to-ten year goal of recruiting 2,000 profes-sionals worldwide who could lead innovation and pioneering work in key technologies, and promote the development of emerging industries. However, this program expanded its scope — recruiting far more than the initial goal of 2,000 individuals — and extended its life through at least 2020. 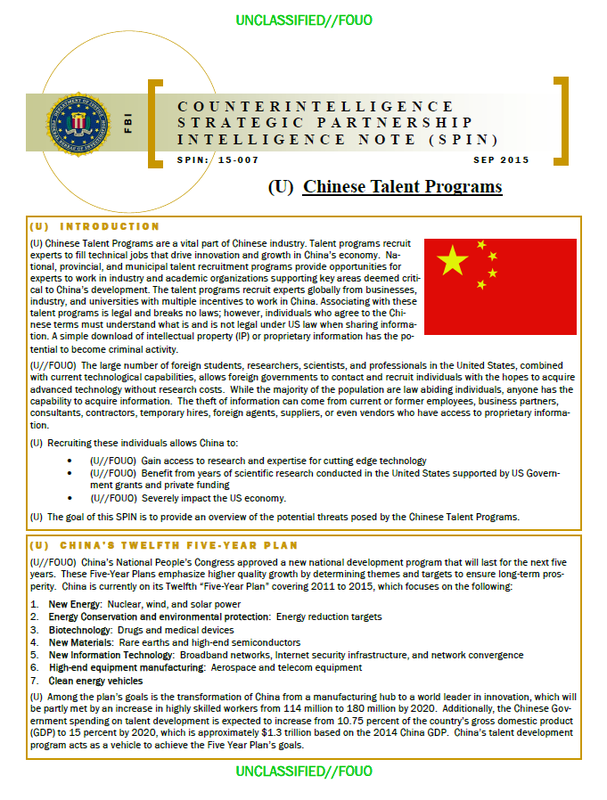 (U//FOUO) Chinese Talent Programs pose a serious threat to US businesses and universities through economic espionage and theft of IP. The different programs focus on specific fields deemed critical to China, to boost China’s national capability in S&T fields. These subject mat-ter experts often are not required to sign non-disclosure agreements with US entities, which could result in lost of unprotected information that jeopardizes contracts or research funding. One of the greatest threats toward these experts is transferring or transporting proprietary, classified, or export-controlled information, or IP, which can lead to criminal charges. (U//FOUO) The threat not only targets businesses or universities but potentially targets the researchers or scientists themselves. The technology researched or developed not only costs millions of dollars but costs years, if not decades to develop. Additionally, the theft of informa-tion or IP creates a risk that someone else could take credit for the researcher’s efforts. The information stolen can be recreated, resold or claimed by others, which in turn will cost the originator creditability and potential funding for future endeavors. (U) Theft of intellectual property is an increasing threat to organizations and can go unnoticed for months or even years. In today’s society, technology affords easier access to every aspect of academia and business. Some of these tools have become effective for recruiting, such as social media. Social media websites often display large amounts of personal data, such as who an individual works for, phone numbers, known associates, previous jobs, and locations. Additionally, websites like LinkedIn have full resumes, detailing the history of an individual’s achievements and accomplishments. (U) The FBI assesses each year the United States loses billions of dollars due to technology transfer. While it is important to conduct collaborative research, it is vital for the survival of US businesses and universities that they protect their information and mitigate lost or stolen in-formation.